Charlottesville City Market, established in 1973, is the largest outdoor market serving Charlottesville. Local vendors sell fresh produce, herbs, plants, grass-fed meats, artisan crafts, and baked goods at the market every Saturday from 7:00 a.m. until 12:00 p.m. from April through October, and every Saturday in November from 8:00 a.m. until 2:00 p.m. Between 4,000 and 6,000 people visit the market on an average market day, but the number fluctuates based on weather and holidays. The market will operate in the adjacent lot owned by the Charlottesville Parking Center in the 2015 season. The market has been located in a 35,762 square foot city-owned parking lot on the corner of Water Street and First Street since 1993, which was originally to be a "temporary" home. Before that, the market was located at the Jefferson School. Some say that the market began on Vinegar Hill, at the intersection of South Street and Ridge Street. City Council appointed a task force in November 2010 to study new locations for the market. The Water Street location offers less than an acre of space for a gathering of over 100 vendors. A new, permanent location might offer increased accessibility for vehicles and handicapped vendors or patrons, running water, bathrooms, seating, and electricity in addition to space for the 130 vendors on the 2010 waiting list. However, vendors and members of Market Central, a non-profit organization created for the enhancement and preservation of the City Market, worry that a new location more remote from the Downtown Mall might lower market attendance. In July 2011, the task force concluded that the market should stay put for at least three years. It also recommended the parking lot be considered a permanent location and an anchor for a mixed-use "market district." A group called the Charlottesville Market District Alliance formed in order to advocate that result. However, Charlottesville economic development officials argue that the land which the market occupies is more valuable for redevelopment. The Charlottesville City Council had not made a decision at the opening of the 2013 season. In October 2012, Charlottesville hired Market Ventures, a market consultant group based in Portland, Maine, to produce a $100,000 study of what form a market district would take. The group presented its findings to the City Council in March 2013, suggesting two alternatives. The first is to allow the market to remain where it is, but redevelop the site to include pervious pavement, shade trees, and "woonerf"-style streets. The second is to move the market one block south, to a triangular lot at the corner of Garrett Street and First Street. The site is currently owned by Station Apartments LLC. This location would feature a plaza with stalls along Garrett Street, plus a wall along the railroad tracks. Market Ventures presented its study to the Charlottesville City Council on July 18, 2013. It estimated that grading, repaving, and improving the market's current site to include green infrastructure, a permanent shelter, and a grassy seating area would cost up to $4.4 million, while moving it to the Garrett and First site would cost $3.6 million but allow the city to develop the valuable Water Street Parking Lot. The City Council will discuss the issue further in September 2013. In 2010, the market expanded to First Street, allowing for more vendors and attendees. In May 2010, the city announced that sales are up for this year as a result. At 11:15 a.m. on July 3, 2011, hundreds of dancers participated in a surprise choreographed dance at the City Market. In July 2013, there were 49 agricultural vendors (selling fruits, dairy, produce, meat, and plants), 22 food vendors (selling beverages and prepared foods), and 20 vendors selling their own crafts (for instance, wooden furniture, jewelry, or photographic prints). In addition, there were 464 vendors who did not have a reserved stall and instead rotated through one of five spaces at the market. In 2012, the vendors reported $1.78 million in gross sales, but Market Ventures Inc. estimates based on number of shoppers and average sales that the number may be closer to $2.7 million. The vendors have an incentive to underreport their sales, since they are charged a fee based on their sales. 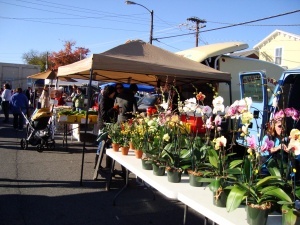 Before establishing a stall, vendors must register with the City Market Manager and complete the Farmers Contract, which can be found on the Charlottesville City Market website. Vendors must pay a fee of $20 to participate in the City Market, in addition to a 6% slot fee to be paid following the close of each City Market day. The market's goal allocates 50% of its space to farmers (defined as vendors of produce such as fruits, vegetables, live plants, meat, and dairy products), 25% to food vendors (vendors who offer baked, canned, or packaged food), and 25% to artisans (vendors selling an artistic service or arts, crafts, and jewelry products). Vendors have to meet state requirements for several factors before being allowed to sell their products at the market. According to the Market Manager Stephanie Anderegg-Maloy, the houses and farms of the vendors are regularly inspected to ensure the health and quality of the residence before vendors may sell their products at the market. Vendors must also meet more specific requirements dealing with raw meat, poultry, and seafood vendors. These vendors are required to obtain a permit from both the Department of Agriculture and the Department of Health in order to sell their products, and they must stamp them with a USDA sticker stating the item’s weight and description. Virginia also inspects all scales to issue a valid certification sticker through the Virginia Department of Weights and Measures. These measures are meant to protect the safety of the food and costumers..
From the first Friday and Saturday in November until the weekend before Christmas Day, a seasonal Holiday City Market operates from 10:00 a.m. until 5:00 p.m. This market is held on the East end of the Downtown Mall. Vendors sell handmade holiday decorations and gifts. Stephanie Anderegg-Maloy is the City Market Manager. The other market in Charlottesville is Farmers in the Park which takes place on Wednesdays from May to August in Meade Park. The city also has a farmers' market at Pen Park open from 3:00 p.m. to 7:00 p.m. every Tuesday May through September. A Farmers' Market operates in Scottsville in the summer from 9:00 a.m. until 12:00 p.m. on Saturdays and from 3:00 p.m. until 7:00 p.m. on Thursdays. YouTube: Charlottesville City Market 2010 on Meet The Farmer TV. ↑ Web. Charlottesville City Market - About, retrieved 5 April 2012. ↑ E-mail. Stephanie Anderegg-Maloy, City Market. "City Council work session on City Market." Message to Claudia Elzey, Charlottesville Tomorrow. 17 July 2013. ↑ 3.0 3.1 Web. Council to seek proposals to redevelop City Market site, Sean Tubbs, Charlottesville Tomorrow, October 22, 2013, retrieved October 23, 2013. ↑ 4.0 4.1 Web. Council clears way for Market Plaza development downtown, Sean Tubbs, Charlottesville Tomorrow, December 2, 2014, retrieved December 8, 2014. ↑ Web. Water Street Lots Owner Information, City of Charlottesville, Page 148, retrieved December 5, 2011. ↑ 6.0 6.1 Web. Task force to study future of City Market, Daily Progress, Media General, November 5, 2010, retrieved November 5, 2010. ↑ Web. The Future of the Charlottesville City Market Discussed, Richmond Times-Dispatch, retrieved 2 Jan. 2011. ↑ "City Council Work Session Minutes." 4 Nov. 2010. <http://www.marketcentralonline.org/market_central_site/City_Council_11_4_10_files/Work%20Session%20minutes%2011-04-10.pdf> retrieved 2 Jan. 2010. ↑ Web. Food for Thought: Where to Put the City Market, Dave McNair, The Hook, Better Publications LLC, 9 Nov. 2010, retrieved retrieved 2 Jan. 2011. ↑ Web. An unmovable feast - Task force envisions Downtown market district, Chiara Canzi, C-VILLE Weekly, Portico Publications, July 12, 2011, retrieved July 12, 2011. ↑ Web. Group Hopes To Find New Home For City Market, Newsradio 1070 WINA, retrieved April 10, 2012. ↑ Web. As season opens Saturday, City Market future still unclear, Graham Moomaw, Daily Progress, World Media Enterprises, April 6, 2012, retrieved April 10, 2012. ↑ Web. City launches study on farmer's market area, Graham Moomaw, Daily Progress, World Media Enterprises, October 18, 2012, retrieved October 22, 2012. ↑ Web. City Market options: Stay in place, or move one block south?, Sean Tubbs, Charlottesville Tomorrow, 12 Mar 2013, retrieved 16 July 2013. ↑ 16.0 16.1 Web. Prosperous City Market may get improved space, Claudia Elzey, Charlottesville Tomorrow, 27 July 2013, retrieved 29 July 2013. ↑ Web. Fire guts building in middle of City Market lot, Daily Progress staff reports, Daily Progress, World Media Enterprises, December 15, 2013, retrieved December 16, 2013. ↑ City of Charlottesville. City Market Continue to See Record Attendance and Sales Figures. Charlottesville, 17 May 2010. Web. 17 May 2010. <http://www.cvilletomorrow.org/docs/20100517-City-Market-Press-Release.pdf>. ↑ Web. Flash Mob at the CharlottesvilleCity Market, Newsplex, 3 Jul 2013, retrieved 19 July 2013. ↑ "City Market Farmers and Vendors." retrieved 2 Jan. 2011. <http://vendors.charlottesvillecitymarket.com/>. ↑ "Free Union Produce and & Gourmet Edibles." retrieved 2 Jan. 2011. <http://vendors.charlottesvillecitymarket.com/category/bakers>. ↑ 23.0 23.1 Web. City of Charlottesville Standard Operating Procedure, retrieved 2 Jan 2011. ↑ "Reserved Space Agreement for the 2010 City Market." retrieved 2 Jan. 2011. <http://manager.charlottesvillecitymarket.com/wp-content/uploads/2010/01/Reserved-Space-Agreement-2010.pdf>. ↑ "City of Charlottesville Standard Operating Procedure." retrieved 3 Jan. 2011. <http://www.charlottesvillecitymarket.com/2010%20docs/regs.pdf>. ↑ Web. Holiday City Market, City of Charlottesville, retrieved January 2, 2011. ↑ Web. , City of Charlottesville, retrieved 16 Jan. 2011. ↑ Web. The Market at Pen Park, City of Charlottesville, retrieved May 1, 2012.